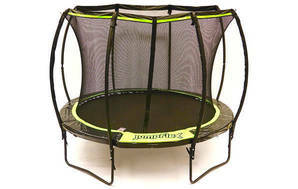 Snapshot: The Jumpflex Classic 100 is a 10 ft sprung enclosed trampoline. But how safe and easy to use is it? Easy to assemble with good instructions. Very easy to enter and exit through the zipped opening. Failed 4 major safety tests: the frame, mat or enclosure failed a structural integrity test, there are impact hazards for the user, and there are possible pinch or crush points. Failed 4 minor safety tests. We assessed trampolines based on the Australian standard, AS 4989:2015. Overall score is based on performance (70%) and ease of use (30%). Performance is based on the number of major and minor failures found with the trampoline. Avg price is from a December 2017 survey. Available in 8 ft, 10 ft, 12 ft and 14 ft models. 18 Sep 2018, Jessica W.